The fight against cervical cancer and ovarian cancer plagues women worldwide. Scleroderma and Myasthenia Gravis are other diseases that are grating on those who suffer from them. 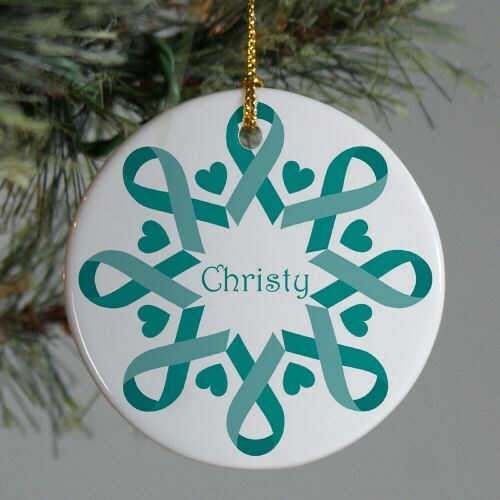 Each of these causes wear teal to show their support, which is why this awareness ornament would be perfect for your holiday tree. This Awareness Snowflake Ceramic Ornament is a flat ornament and measures 2.75" in diameter. The Ornament includes a ribbon loop so it can easily hang from your tree or ornament stand. Free personalization of any name is included. Very nice quality. The name was a little smaller than I thought it would be. This holiday season, give your friends and loved ones who are struggling with cervical cancer, ovarian cancer, scleroderma, and myasthenia gratis hope and support. This snowflake ornament will do so in an appropriate, subtle way. Our Teal Ribbon Snowman Ornament is another great addition to your tree.